Lack of trust for others in their communities and a drop in perceptions of personal safety. Higher levels of drug use and poor mental health. Deteriorating levels of health (obesity, third world health issues reoccurring). Growing disparity in educational achievement. Growing levels of violent crime. Social mobility restricted and those less advantaged less likely to advance themselves. All the above are being reflected in New Zealand as our society continues to become more divided. Currently the top one percent of New Zealanders have the same collective wealth as the bottom 60% and with the most wealthy seeing a 20% increase in their wealth over the last year, the bulk of New Zealanders are finding their incomes aren't keeping up with the rate of inflation. We need to get back to building healthy communities and healthy families and a good part of that is ensuring that all New Zealanders are financially secure. We should not have 250,000 children living in poverty at the same time as we have a record $480 million (approx.) spent on new Bentleys. Wealthy businesses and employers should value their workers and share the profits amongst all who have had a considerable contribution in making them. New Zealand was known as being a clean, green and egalitarian society, this is no longer true and I wonder what will be a more accurate description of us five years from now as we follow the current path of governance? What would you do? What would he Greens do? There was an interview with one of New Zealand's more successful entrepreneurs (missed the name) this morning and he said that New Zealand exporters are trying to make up for our high dollar by keeping wages down. His view was that successful economies at the moment are keeping the value of their currencies lower, which boosts export prices and curbs private spending. Considering we have high private debt and a high dollar this course seems rational. The Greens would raise minimum wages (fully affordable) and green and innovative business. It is interesting that organically produced dairy produce achieves premium prices but Fonterra and the government have pulled their support for organic farms. Our environmental crises with our rivers needs urgent attention and surely organic methods would be useful in addressing this issue and there would be some financial compensation for doing so. Higher wages also means a stronger domestic economy, a fairer sharing of the tax burden and a reduction of all those negative consequences mentioned in "The Spirit Level". It is worth reading, Shane. 1. NZ exporters are lowering the wages they pay to compensate for the high NZ dollar. 2. Successful economies keep their currencies lower. 3. Low currencies boost export prices and curb private spending. 4. You believe this seems rational. 1. Raise the minimum wage, and state this is affordable. 2. (presumably you mean that they would) promote businesses which are green and innovative. 5. Promote organic farming as a means of supporting point 4 above. 6. Make some financial compensation to organic farmers. 7. Higher wages (presumably through raised minimum wage, but also perhaps from the successes of supporting innovative and green businesses) mean a stronger domestic economy. 8. Higher wages (presumably you mean higher minimum wages) create a fairer sharing of the tax burden. 9. Higher wages (presumably you mean higher minimum wages) reduce inequalities. 10. Inequalities (unequal societies) create problems which are alleviated by raising the minimum wage. 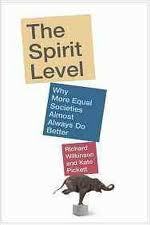 I read the spirit level several months ago. It was the entrepreneurs view that wages were being kept down so that exporters can remain competitive and Bill English practically admitted this as well. What I meant by compensation for going organic was just the higher prices they would receive from existing markets. Te Greens taxation policy link seems to discuss mostly the CGT & WFF but also alludes to increasing minimum wages. I did not see too much other detail on how it would narrow the disparity. Maybe those two measures would be enough. So wages are being kept down to assist exports. Who is keeping wages down, and how? And the greens would not support organic farming over any other sort. I think I am getting it now. Interesting kiwi discussion on the spirit level here.